For those of you itching to know, I love LOC Bonecrusher! By the way, LOC Bonecrusher is roughly 1/108 length or 1/102 width, while LOC Prime is either 1/96 or 1/102 using the two standard widths. 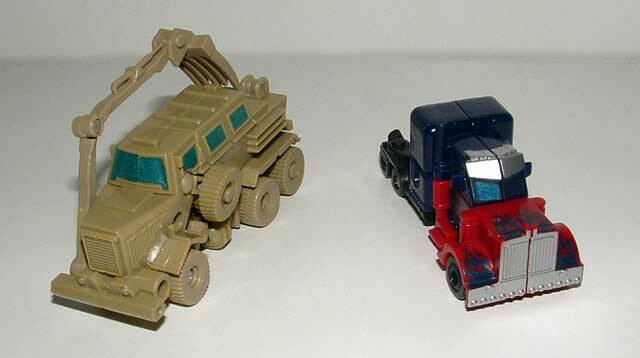 So, one way we have the only versions of Bonecrusher and Prime on the same scale, for the ultimate slugfest! 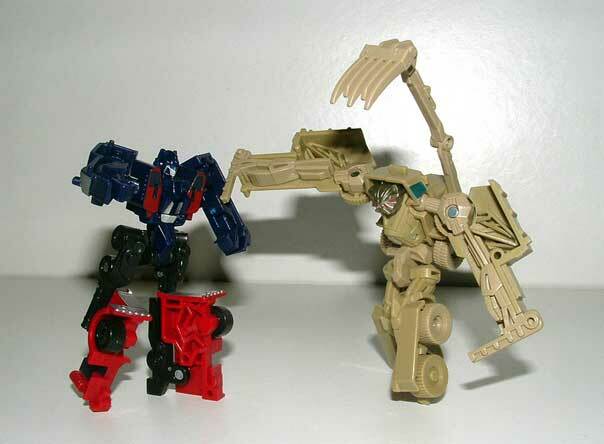 Bonecrusher and Autobot Jazz are natural enemies. The big Decepticon is filled with hate for all he sees, while Autobot Jazz is cool with pretty much everything. It�s no surprise that in this final battle for the AllSpark, with the fate of the Universe on the line, these two warriors face off for a last battle � this time to the absolute finish. The �big Decepticon�� Well, in Legends class, Bonecrusher is smaller than Jazz. But, as bizarre as that seems, it has been the rule with Movie Legends figures � all the larger characters have been smaller figures than their Deluxe-scale colleagues (except for Ironhide � guess he�s the exception that proves the rule!). And, erm, a final battle which features two dead characters (killed quite independently of each other, and with zero on-screen interaction), is also quite strange. However, bio quips aside, this set is a rather mixed-bag. I have always disliked the appearance of Legends of Cybertron (LOC) Movie Jazz, and had no intention of ever owning him. We�ll get in to the reasons for that when we hit his section of the review. The trouble is, he ended up being released with a LOC version of Bonecrusher, which, from initial photos, looked rather good (in the context of Movie LOC figures � which are generally sub-par when compared with previous LOC lines). Still, photos can be misleading, and so this presented a quandary � risk buying the set and finding both figures to be poor, or miss the opportunity of owning a decent Bonecrusher on scale with an Optimus Prime figure? Well, thanks to help from Clay, I went for it at a very affordable price (lower than equivalent UK retail is likely to come to for such a set anyway), and lucked out � at least with Bonecrusher! So, Jazz, Optimus Prime�s Lieutenant, is rank 8 (as is Ironhide, his weapons master), and, erm, who is rank 9 in the Autobot Movie faction? Probably best to get something straight right now: I never really liked any of the previous Jazz toys, despite enjoying the character. However, I had hoped the film may go some way to reconciling my diametric views. Unfortunately for me, it has� Just not in the way I�d hoped! So, to counterbalance the negative review of the LOC Movie Jazz mould which follows, it may be best to read Ganon578�s review of the original release. Jazz�s alternate mode is ostensibly a Pontiac Solstice GXP. That�s one curvy sports car. Not a bad choice of new alternate mode for the character, and it looks good on film, and in the Deluxe class toy. Alas, it does not look so hot in Legends class � although certainly not due to scale. This figure is all just bad design. Measuring 3� (7cm) long, LOC Jazz is roughly 1/52 scale, but is highly warped. The flowing curves have been terribly simplified, while various details just totally destroy any pretense that this is a serious attempt at representing even a highly stylized Solstice. There are two of these oddities � the first, and lesser, being two prongs at the front of the car, which provide counterbalance for the feet when in robot mode. The other, and by far the most serious, is the additional car front slapped on the roof behind the windscreen. This is hiding the robot mode head � and not very well, considering you can still see the antennae and back of the head! In the words of many, that is �incredibly crap�. Period. It�s now worth mentioning that, although this version of LOC Jazz is named identically to his individual release, there are differences in the paint applications. This is a mixed blessing. The windows are now all painted blue � a definite improvement on the black windscreen and unpainted door windows in the original. Unfortunately, none of the front details (grill or headlights) have any paint applications, while, also unfortunately, the additional roof-mounted car front has been gifted with a highly detailed paint app! The grill is black, lights yellow, and small triangle (standing in for Pontiac logo � which is a pretty good show on such a small figure) red. This obviously draws a lot of attention to this absolutely appalling feature, when compared to the original, where at least the grill was left unpainted. The rear lights are not painted either, in this release, although the rear spoiler has black edging � bizarre! Frankly, LOC Jazz�s alternate mode is one of the worst of any LOC figure (and perhaps any Transformer), although, arguably, the original release has the better alternate mode (due to the unpainted secondary grill, painted front details, and rear lights � this release has better windows, and that�s it!). Jazz�s transformation is not as straightforward as you�d expect, given the liberties and short-cuts taken (particularly that additional grill! ), but it�s hardly complicated. It�s just rather tragic � this figure could have been so much better, with a simpler transformation! Jazz stands 3� (7cm) tall in robot mode, smashing comparative robot and car scales, and towering over the other Movie LOC releases! Bizarre, as Jazz is supposed to be the smallest character, bar Frenzy. Undoubtedly, this release of Jazz has the superior robot mode when compared to the original release � paradoxically due to the black detailing on the secondary grill!! However, that detail aside, this release of Jazz has less paint applications than the original � lacking all gold detailing. And what�s with the Autobot insignia on his crotch?? He is a rather plain robot � with very little moulded detail (even his shoulders are just tubes, like a Spychanger!). His head, while simplified and chunky, is perhaps the best feature, with decent detailing and metallic blue visor. Bizarrely, his hands are carefully sculpted � but are humanoid, unlike his four-fingered claw in the film! To give credit, LOC Jazz does at least have the car grill and rear spoiler sandwiching the head, as in the film � if only it were the genuine grill, and not a faux affair! Frankly, LOC Movie Jazz is a joke. There is no excuse for such a poor figure, and why Hasbro would re-release him (three times to date, no less! ), I cannot fathom. 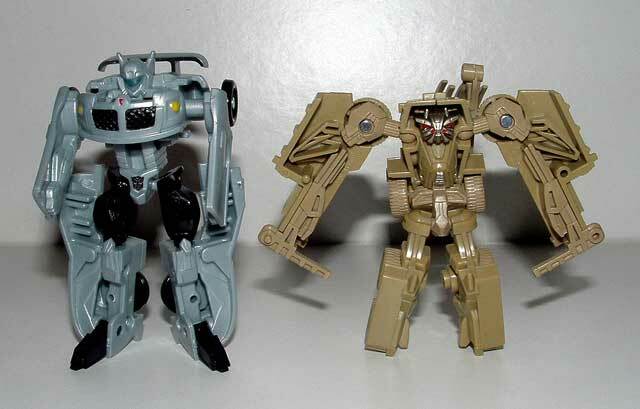 Even a G1 paint-scheme, or perhaps G1 Shockwave (let�s face it, there are similarities in the designs) would have maybe justified a repaint, but not even this would have made the mould worthwhile. There�s only one reason anyone would own LOC Movie Jazz, knowing the problems with the mould, and that reason is � LOC Movie Bonecrusher. Bonecrusher�s alternate mode is an interesting one indeed � a Force Protection Buffalo Mine Protected Clearance Vehicle (MPVC). I can�t think of any other Transformer that used a mine clearer as its alternate mode, but it�s a smegging good choice, and great military interpretation of a Constructicon. Of course, the film version has a particular alteration in proportion, separating it from reality � namely, the huge claw like blade on the end of the manipulator arm. In the real world, that thing is rather small (when I say small, I mean you�d be frightened by it, but it couldn�t scoop up a car� it�s all perspective). Unfortunately, the Transformers live action movie designers came across a forced perspective shot of the machine, featuring a huge fork on the end of the manipulator arm. Instead of going with the smaller accurate dimensions, though, they opted to create an add-on to make the thing look larger on film � which has, understandably, carried through to the toy line. So, what would have been a rather unassuming blade has become a massive feature on the figures. Fair enough. There is much moulded detail � understandably simplified for this tiny release. The whole affair is cast in khaki plastic, with metallic blue picking out every moulded window (a rarity in Movie LOC figures), and a Decepticon insignia printed on the right side. But, that�s it for colour. Even the wheels are khaki. A shame really, although for the tyres I can stretch my imagination and say, maybe they�re covered in mud? (My Land Rover�s tyres are that colour much of the time � along with the actual wheels, for that matter�) I am rather disappointed that there is not even an extremely simplified version of the Bonecrusher symbol anywhere to be seen, but I guess that�d be pushing things. Unlike the Deluxe Class figure, LOC Bonecrusher has a generally proportionate manipulator arm (bar fork), which is attached to the correct place (right side of truck). The manipulator arm is articulated, and poseable in this mode. Other than the size discrepancy, it varies from reality (and the film) in that it has only five prongs, whereas the real vehicle has nine (I�m a little unclear as to how that becomes eight in robot mode in the film�). � but we can forgive them, as nine blades would have been rather brittle on such a small figure. 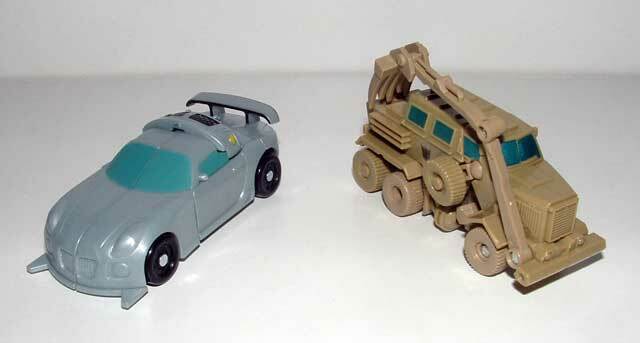 Overall, I�d say that Bonecrusher displays well, and plays well, in Buffalo mode, at LOC scale. I do not own the Deluxe figure, but I expect that the LOC version�s transformation follows generally a similar sequence (obviously with less complexity). It is simple, and fun, although results in the entire upper body and arms effectively being revealed, as opposed to reorganised Buffalo parts. From the front, standing about 2 �� (6.5cm) tall, Bonecrusher looks very much like his Movie incarnation. Unlike Prime, Bonecrusher�s design takes advantage of the almost shell-former transformation, and has a highly detailed upper body and arms (unfortunately, there is little in the way of paint application, contrary to stock photos � he just received a silver �four-pack�). The head, equally detailed, is highlighted by metallic iron paint and has red eyes (as well as a couple of red nostrils, for some reason�). He appears hooded, and reminiscent of the Battletech / Mechwarrior Daishi BattleMech � somehow appropriate given his bulk. Unfortunately, the arms sport the obvious silhouette of the Buffalo, and have ladders hanging off the fingertips. On the plus side, LOC Bonecrusher still has wheels within his feet (these moulded and unmoving), which is a nice touch. Of course, from the rear, Bonecrusher looks like an oddly arranged piece of rather expensive modern art � but who�s gonna display him that way round, seriously? The manipulator arm is able to move forward, and attack any Autobots in robot mode, although cannot be split to form the Venus-fly-trap type design featured in the film. The rest of the figure is rather well articulated for a Movie LOC, with six points of articulation (ignoring the manipulator arm) � four of which are ball joints (shoulders and hips). All in all, with an excellent alternate mode and superb robot mode, LOC Bonecrusher has to be my favourite Movie LOC released to date. Transformation: 4 � Both transformations are simple, although trying to get Jazz�s arms lined up for robot-to-car can be irritating. Durability: 6 � I am very concerned that the plastics used are not of the highest quality, and, particularly, that Bonecrusher�s manipulator arm may snap at any time. Fun: 8 � This score would be �10� if Jazz weren�t dragging the set down. Bonecrusher is that good. Price: 9 � At under $8 (�4), Bonecrusher is worth it, even with Jazz tagging on. Overall: 8 � Bonecrusher is great � a real gem in a rather poor line. Unfortunately, Hasbro decided to package him with Jazz � their worst LOC mould in history. It would have made far more sense to have sold Bonecrusher with Optimus Prime, in any size Class, but here we have him with Jazz. Still, he is worth the price (although I do live in the UK, where that price seems good � at a likely �6 - �8 retail here, I would not be nearly so keen�).